The shielding effectiveness of an enclosure is a function of the wavelength of the frequencies involved versus the length of the longest dimension of openings. 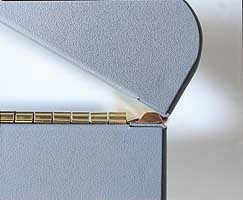 One common example is the seam opening occurring between the door and the sash of an electronic cabinet. Shielding gaskets are very low resistance connectors matching surfaces which; when installed, make the surface appear as one continuous RF absorbing surface. The graph below displays the maximum shielding effectiveness possible from a given size opening (slot) in an enclosure. It can be seen from the information above that the shielding effectiveness increases as the size of the opening is reduced. In order to achieve the same performance as a small opening, the slot must be coupled electrically across its opposing surfaces. This can be accomplished by using conductive fasteners or gaskets. Gaskets are usually the most common choice. They offer a continuous coupling along the full length of the slot while permitting the opposing surfaces to be separated easily for access to the components contained within. See the photo below. Top view of electronic enclosure door with typical shielding gasket installation.